Fish Plant: We did not plant any fish this week. Vagan Tapaltsyan of El Cerrito caught a 151b catfish using a redworm power-bait combo at Sandy Point on 5-20-18. James Stoker of San Rafeal caught some trout fishing from a boat on 5-21-18. Liam Clark of San Pablo caught a 4.93lb trout using a orange sinko in Scow Canyon on 5.25-18. William Demar of Orinda and Kids caught 4 trout using worms in Scow Canyon on 5-26-18. Carlos Buruntes of Ripon, Ca caught 2 trout the largest weighing 4.68 using night crawlers on 5¬27-18. Silas Napitam of Richmond caught 4 trout using micetails and power-bait in scow canyon on 5-28-18. 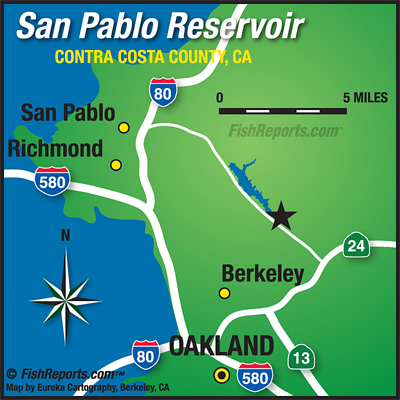 San Pablo Recreation area is open daily the month of June from 6:00am — 8:00 p.m. Boats having to be off the water at 7:00 p.m. The café is open, Friday, Saturday & Sunday from 10am to 4 pm.